♘ Alerting you at first signs of danger or distress, such as colic, injury or foaling. ♘ Giving you valuable information and statistics on his daily behavior and routines. Design your farm with areas important for your management, such as; paddock, pasture, training area, riding arena, gates and areas for feeding. the day. Analyze who he likes to stay close to or avoid. Get an alarm if your horse is not where he is supposed to be or if he is waiting by the gate. You can follow the route if traveling or hacking out. Analyze your horse's activity and how the pattern changes over days, weeks or between rest-days and work-days. When changing routines you can analyze the impact on your horse's behavior. This will give you directions for improvement. You can observe if somethings tends to get out of the normal. It there is a significant change HoofStep® will notify you instantly in your phone. In addition you get information of what the change in behavior indicates. Invite your friends, co-riders, coach and veterinarian to join your farm and connect to you. Get notified about what happens even when you are not around. Share information, shoot instant photos, share on Facebook or push to get attention. Notifications from HoofStep® regarding your horse will be visible and saved in your horse's channel. So you can go back if needed. Use your own horse digital version of your real horse as emojis. Create a digital version of your horse. You can choose between various breed types, colors and markings. The digital horse shows his current behavior in the app. Your personalized 3D horse's behaviors are choosable in your emoji library when using the chat. 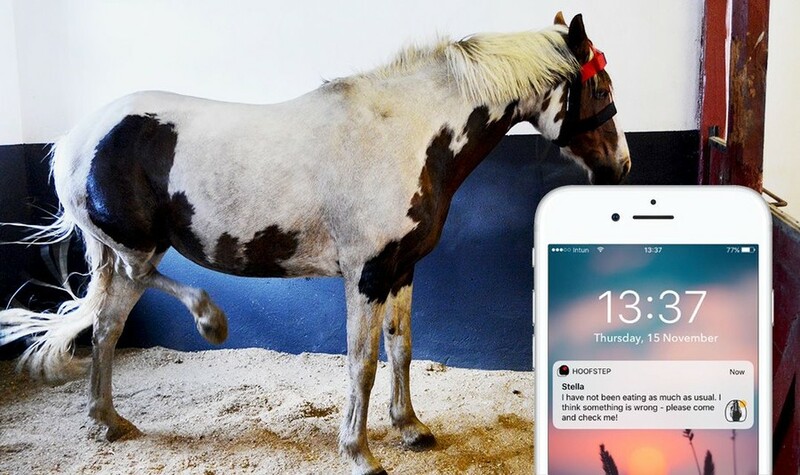 HoofStep® sends you instant alarms if something is out of normal, such as an indication of colic, laminitis, lameness, acute injury, stress or approaching foaling. Alarms are sent as push notification but are also saved in the horse's chat channel. HoofStep connects you with your horse 24/7. A sensor placed on the forehead collects all data required for telling you whether you need to take action or not. The sensor communicate with a portable base unit (as well as a charger) placed at the farm or, if traveling, inserted into the cigarette lighter in your car. The tailored halter is in a breathable light sport textile, non invasive and easy to attach with a single velcro fastener. The halter is designed with veterinarian expertise. We complement traditional veterinary routines, by using horse's behavior as primary source for indications of potential symptoms. We use big data and deep learning methods on robust behavioral data. Our collaboration with veterinarians and researchers ensures a development aligned with expertise and field experience from the veterinary profession. By this we are able to do earlier identification of potential health issues than what has been possible with current methodology. At the same time provide instant indicators of potential injures, health issues or mental hazards. 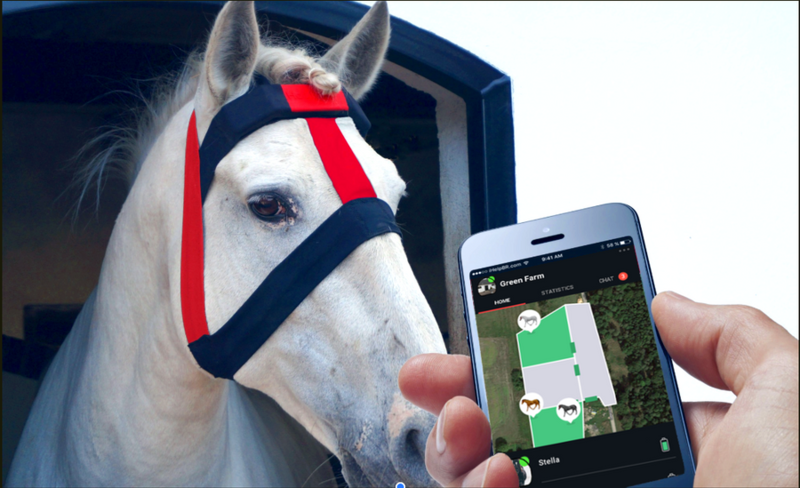 HoofSteps sensor is placed on the forehead of the horse. This location gives the most complete data of behavior, such as chewing. Drinking and eating behavior are important indicators of a horse's well-being or pain experience. 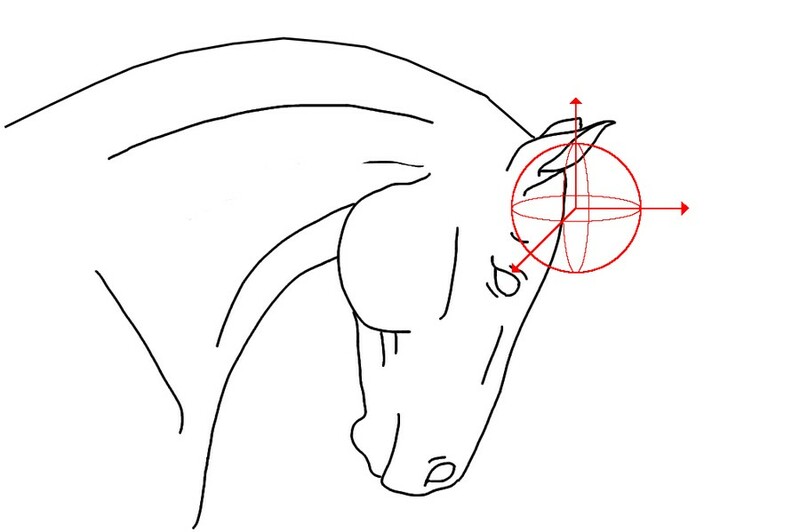 All movements derived from the head position combined with the position of the horse gives all the data required for our algorithms, and by that telling the horse's current behavior. By combining different behavior we receive information that could be an indicator of an evolving health issue, such as colic or laminitis. Our model originates from a number of basic behaviors, building a profile for each individual horse over time, as well as a common general behavioral profile. By using HoofStep® in a group of horses we identify social behavior and interaction. Other deviations from an individual pattern, combined with background data of the horse, can be an indicator of a situation of importance, such as approaching foaling, stress or an uneven motion pattern.